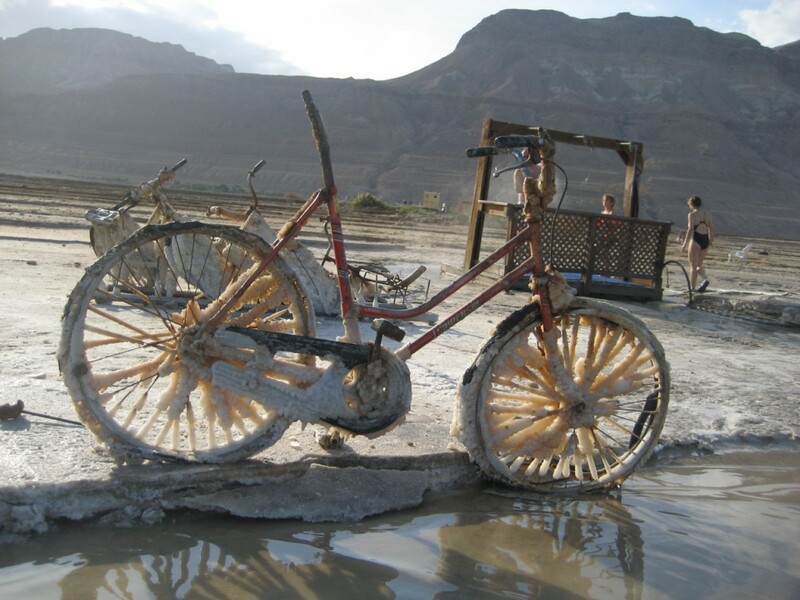 "Petrified Bike" Metaphor for a Shrinking Dead Sea? 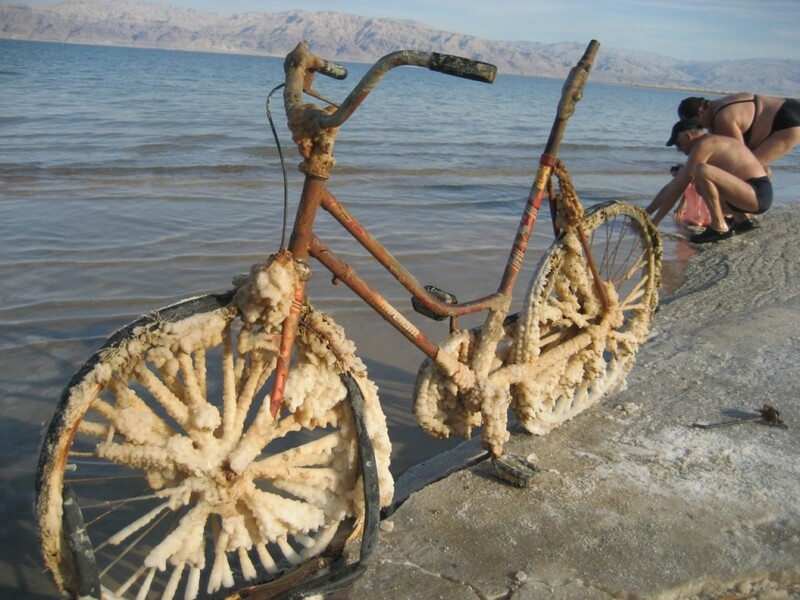 Everything’s dead at the Dead Sea; even bikes that get left behind. It’s pretty shocking when you are out there to see for yourself how this world’s natural wonder is shrinking year by year. It makes you want to scream. Here are some pictures from my visit to the Dead Sea about 6 weeks ago. From the Dead Sea Spa we took a few minutes bus ride to the Dead Sea edge. The spa, about half a kilometre away used to be on the Dead Sea’s shore. The spa didn’t move, so what does that say? The bike pictured above (and the ones in the rack below) reminds me of some relic that future people would see, if the world would go on without us. Now how you can save the Dead Sea from shrinking? First up, I would avoid buying water from Ein Gedi, a natural spring water company, siphoning water from springs which should be running off to the Dead Sea and replenishing the wildlife at the Ein Gedi Nature Reserve. On the Jordanian side of the Dead Sea, Arab Potash (APC), formed in 1956, produces 2.0 million tons of potash annually, as well as sodium chloride and bromine. 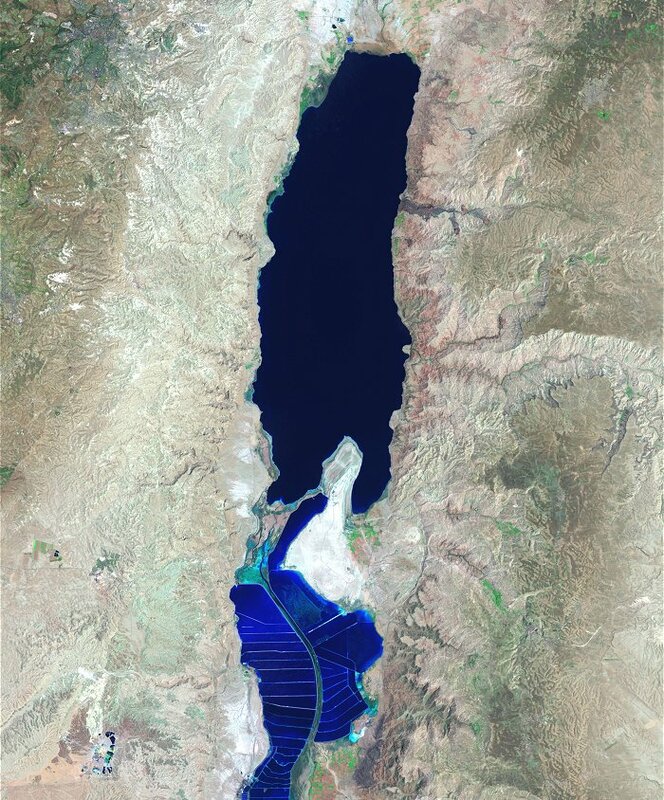 Both companies use extensive salt evaporation pans that have essentially diked the entire southern end of the Dead Sea for the purpose of producing carnallite, potassium magnesium chloride, which is then processed further to produce potassium chloride. The power plant on the Israeli side allows production of magnesium metal (by a subsidiary, Dead Sea Magnesium Ltd.). The salt evaporation pans are visible from space. Dead Sea from space. Image via NASA. Lastly, the only water that’s heading into the Dead Sea from the Jordan is reportedly sewage from the Palestinian Authority. The Dead Sea needs natural run-off from rivers and springs to enter its shores. If not it will be a natural disaster for this natural wonder. I think we can do a whole lot better than through messing with nature than supporting the Red-Dead canal which is to bring saline water to the Dead Sea via a pipeline from the Red Sea. Leave your thoughts and peeves in the comments section.